With a four-day weekend comes four lie-ins, and with four lie-ins comes four inevitably late nights. But don’t fret; Anatomicals, the witty and whimsical beauty brand, has put together a foolproof kit to keep you fresh as a daisy. Aptly named The Partied Too Much Pack, you’ll find Oi You Throbhead, a pocket size Indian head masseur, otherwise referred to as headache relief balm, Puffy The Eye Bag Slayer revitalizing eye mask to banish dark circles, and Snoozers Are Losers – energy patches for an extra bit of oomph. Who knew beauty had such a punny side. 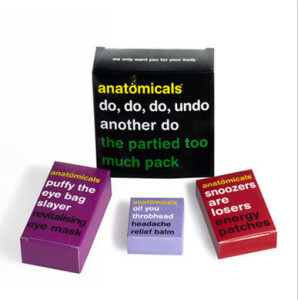 The Anatomicals ‘hangover cure‘ Gift Pack is perfect to aid the recovery of your party animal and will help them make it through that morning after feeling! So don’t worry the, ‘Anatomicals – do, do, do, undo another do – the partied too much pack’ is the perfect gift for all party animals everywhere. Gift Pack Contains: 1 x PUFFY THE EYE BAG SLAYER – Revitalizing Gel Eye Mask, 1 x OI! YOU THROBHEAD – Headache Relief Balm 20g, 1 x SNOOZERS ARE LOSERS – 6 x energy patches.